PRE-HEAT the oven to 180 degrees Celsius. FILL a large pan with water and salt and bring to a boil. REMOVE the seeds from the chili peppers and PEEL the red onion and garlic cloves. DIVIDE the halved peppers along with the onion and garlic in large pieces of the oven tray lined with parchment paper. ROAST the peppers, onion and garlic in the oven for about 15 minutes. Or until they’re soft enough to create a puree. Use a small blender with a bit of olive oil to create a puree. Meanwhile DIVIDE broccoli into florets and COOK them shortly in the boiling water. 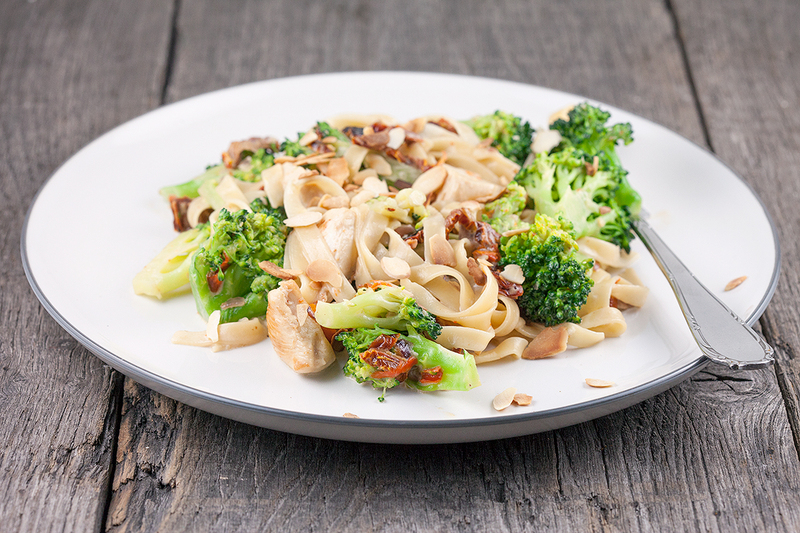 TRANSFER the broccoli to a bowl and bring the water to a boil again and COOK the tagliatelle al dente. 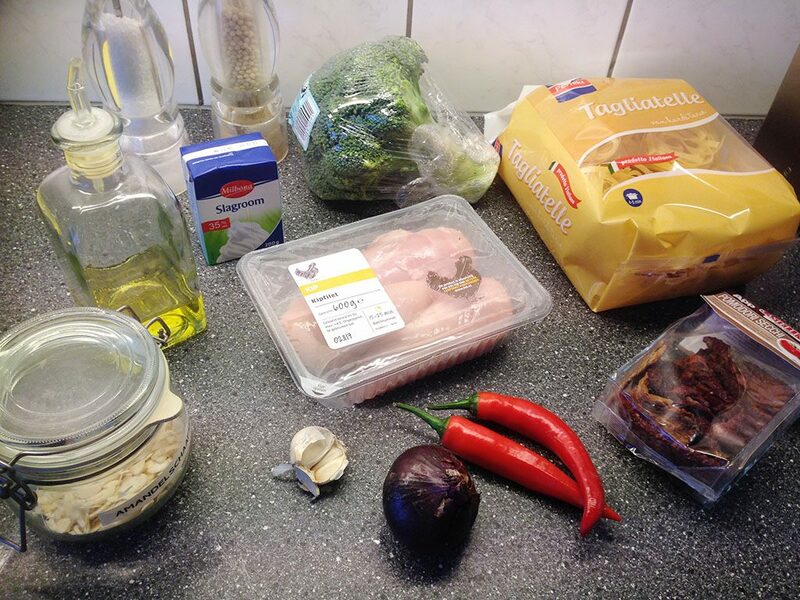 CHOP the sun-dried tomatoes into pieces and remove any excess fat or muscles from the chicken and divide into bite-size pieces. ROAST the almond shavings in a dry skillet until they’re golden brown and set them aside in a small bowl. HEAT a bit of oil in a large skillet and cook the pieces of chicken for a few minutes. ADD sun-dried tomatoes along with the red pepper paste and cook this a few minutes more before you add the cream. 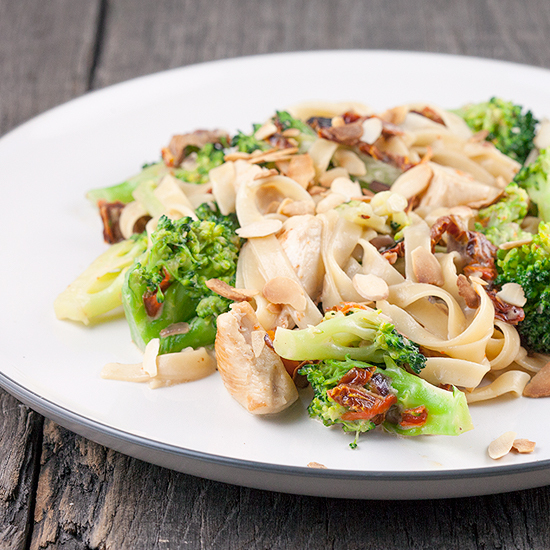 DRAIN the tagliatelle and ADD it along with the broccoli to the pan. 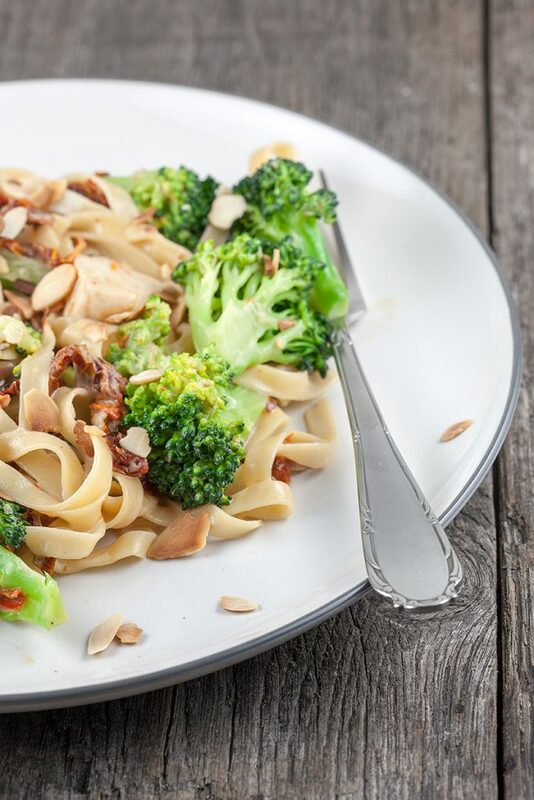 SEASON with pepper and salt and finish the pasta with almond shavings. Enjoy!